Apply directly to the forehead! 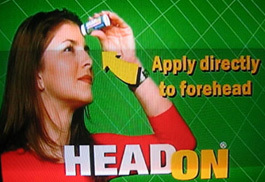 Head On is an ointment you evidently apply directly to your forehead. For what, I can't exactly say. I guarantee you won't forget how to apply it. Next post: People in Threes Going Up in Smoke . . .